Complete a picture by scrolling divided pieces. 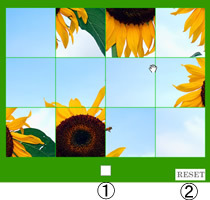 Select a picture of scroll puzzle at the start. When you click START button, a picture goes into pieces. Move the piece by clicking on it. You may not move only one piece. Divided pieces lined up in tandem or in a horizontal row move at the same time. The off-screen piece comes into the screen from the opposite side. Click the square button of ① to put divided pictures into the correct position. Use a complete picture as a guide. Click RESET button of ② to finish the scroll puzzle and go back to a puzzle selection screen.